A two-day Drama Workshop for 8-13 year old children which led to a public performance at Blackheath Concert Halls, London. The performance was based on a Polish myth (The Dragon of Krakow, adapted by playwright Colin Fancy) that tells how villagers defeat a greedy dragon through ingenuity and imagination. As Workshop Leader, Jillian Wallis led a group of 18 young people through a creative process that included improvisation, text and character work, and ensemble performance. Part of the task was to devise theatrical material to embellish an existing script and to blend the dramatic performance of the children with the visual world created by the costumes and props team. 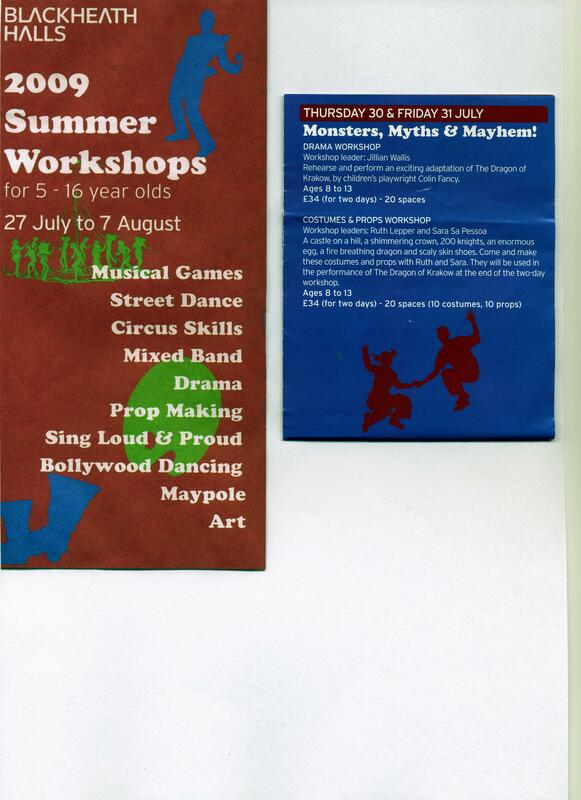 This was part of an arts programme held by Blackheath Concert Halls in Summer 2009, part-funded by the organisation itself and the participants' fees. Workshop Leader, Jillian Wallis was invited back to the venue having previously directed 3 other theatre workshops there, all of which led to a performance by a specific age group (including Dream Physical Theatre in October 2008, which used children's remembered dreams as a starting point for devising a theatre piece).